Gibson introduced their new top-of-the-range 300-series Electric Spanish model 355 Thinline Double-cutaway semi-hollowbody electric archtop guitar in 1958. As per the flagship models in their solidbody electric and electric hollowbody lines (the Les Paul Custom and Super 400CES, respectively), the ES-355TD/SV can be recognised by its five-piece split diamond headstock inlays. 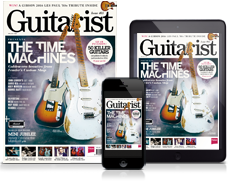 In addition, it can be clearly differentiated alongside its double f-hole, centre blockequipped siblings - the ES-335TD and ES-345TD guitars - by its large block fretboard inlays (the 335 may be identified by either dots or - from 1962 onwards - small blocks, while the 345 boasts double parallelogram fretboard inlays). The 335, 345 and 355 share identical body dimensions (16 inches wide and 15/8-inches deep) and are constructed using arched laminated maple and a glued-in-one-piece mahogany neck with a 24¾-inch scale length joining at the 19th fret - the only notable difference in tonewood being the 355’s ebony fingerboard in place of rosewood. All three guitars are fitted with dual humbuckers recessed into a feedback-hindering maple centre block, a three-way pickup selector switch and separate pickup volume and tone controls. However, as per the 345, the 355 may also come furnished with a Varitone switch, including stereo output (in which case an ‘SV’, or Stereo Varitone, is added to the end of the model name, thus ES-355TDSV). 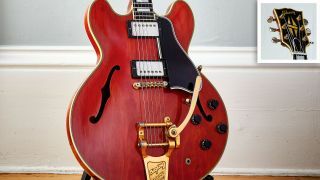 Gibson didn’t hold back on its design for the ES-355, embellishing it with the hallmarks of its most upmarket guitars. Sporting gold-plated hardware, along with multiple-ply body, headstock and pickguard binding, 355s were also fitted with a Bigsby or sideways vibrato system (with the rare exception of stop tailpiece equipped examples). Prior to its release, the factory had been experimenting with a cherry-red finish, and the 355 was the first of the Electric Spanish guitars to receive the new paint job as standard, as opposed to sunburst or natural finishes. Adorned in Gibson’s new Sunday best, the flamboyant 355 seemed like a surefire winner after being cherry-picked by electric blues legends B.B. King (who christened his ‘Lucille’) and Chuck Berry, as an instrument of choice, while it also found favour with Keith Richards and, later, Noel Gallagher. However, despite its prestige, the 355s popularity was surpassed by its more austere, minimal and straightforward relative, the 335. Aside from enabling a more simplified approach to playing, the 335s lighter weight, sans vibrato and hefty Varitone circuitry, coupled with a sustainfriendly stop tailpiece made them more desirable. Thus, the down-spec (albeit rarer) 355s tend to be more sought after. Gibson eventually ceased regular 355 production in 1982, although by this stage the company had already began offering the excellent 355-derived B.B. King Lucille models as an alternative. Since then, 355s have appeared in several forms including as the Alex Lifeson ES-355 VOS along with various reissues. This year’s range includes the ES-355 VOS Bigsby, the ES-355 Walnut Maestro and the ES-355 Black Beauty.